Get Likes for Instagram lets you get more likes on your photos for free. This is the easiest way to get more exposure for your Instagram photos. 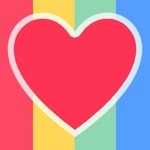 Simply like photos from other Get Likes user to earn coins. Once you have coins you can spend them to get likes on the photos you choose. (2 coins = 1 like). - Does not put any limitation on the amount of likes you can get. - Simple, free and lightweight. When you order likes on one of your photos it is displayed to other Get Likes users until it has received the desired number of likes. * Get Likes for Instagram will never like a photo for you without your consent.